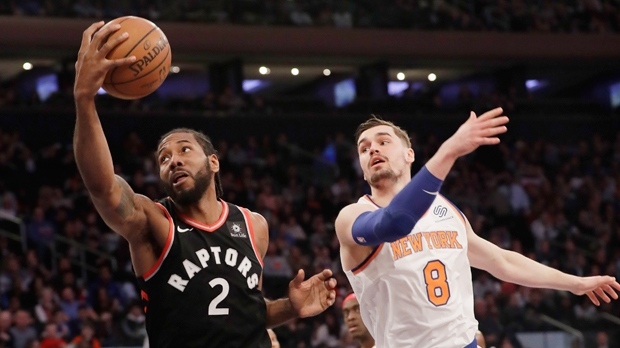 NEW YORK -- Marc Gasol had seven points and six rebounds in his Toronto debut and the Raptors sent the New York Knicks to their 16th straight loss, 104-99 Saturday night. Acquired from Memphis before Thursday's trade deadline, Gasol played 19 minutes. The three-time All-Star entered late in the first quarter and made a hook shot on his first try. Kyle Lowry scored 22 points and Serge Ibaka added 15 points and 13 rebounds for the Raptors. New York closed to 91-90 on a 3-pointer from rookie Kadeem Allen with 5 minutes left. Danny Green hit back-to-back 3s to extend the lead 97-90. Mario Hezonja's 3-pointer with 11 seconds to go pulled the Knicks within 102-99. A pair of free throws from Lowry sealed it with eight seconds left. New York has lost 29 of its last 31 games. The Knicks took a 14-3 lead on Jordan's put-back dunk before the Raptors called a timeout. Raptors: F Kahwi Leonard returned to the lineup after missing Thursday's game at Atlanta due to a sore left knee. He scored 11 points, shooting 4-for-15 in 32 minutes. Knicks: Allen had a career-high 14 points. Raptors: Host the Brooklyn Nets on Monday night.